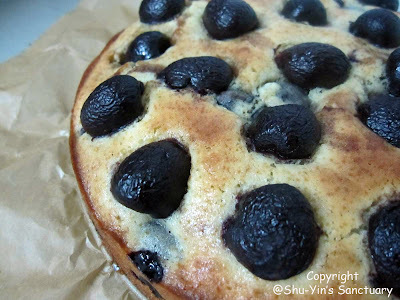 This Cherry Cake was my first bake using my new red baby. MIL gave me a packet of fresh cherries last week. 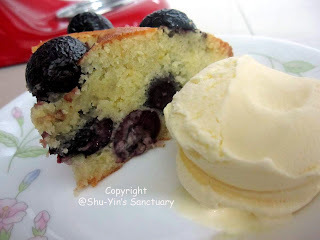 I knew I had to bake something with this because they are now too ripe to be eaten just like that - I don't like fresh cherries that had gone soft. So I googled for recipes online. 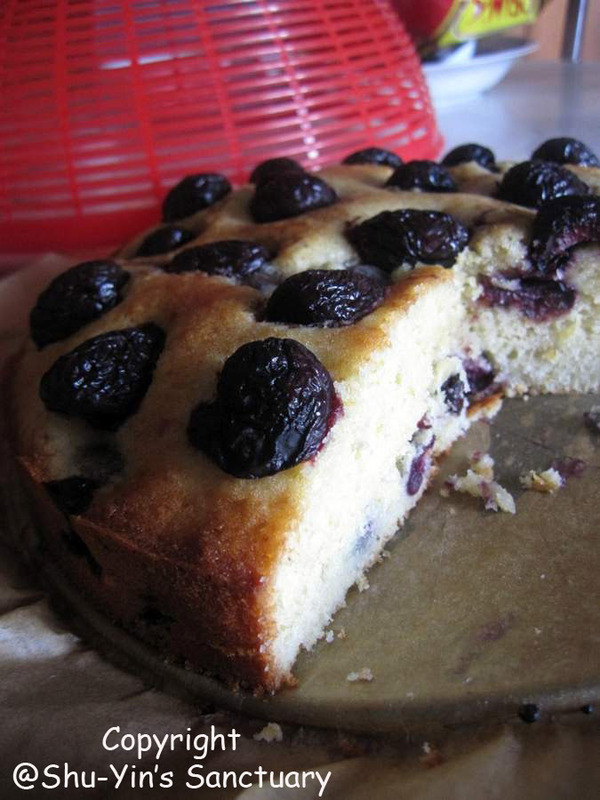 Found that most cakes used canned or glazed cherries. 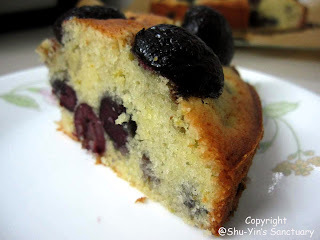 Then I saw joyofbaking's cherry cake which looks simple. So I decided to give it a try. I started making the cake at 11pm (yes, another midnight bake!) and spent most of the time pitting those cherries. I don't have a cherry pitter so I was pitting them clumsily using a small knife. The juices stained my clothes and my wooden chopper board. After pitting, the rest was simple. Instructions were clear and short and not long after that I had my batter in the pan. 35 minutes later, my Cherry Cake is out from the oven. I was lazy to cut my parchment paper into a circular piece to line the pan, so I just 'clipped' a large piece of parchment paper into the bottom of the springform pan while I butter the rounded sides of the pan. Hehe. The cake was released beautifully from the pan. Sides were crisp and brown and did not stick to the pan. 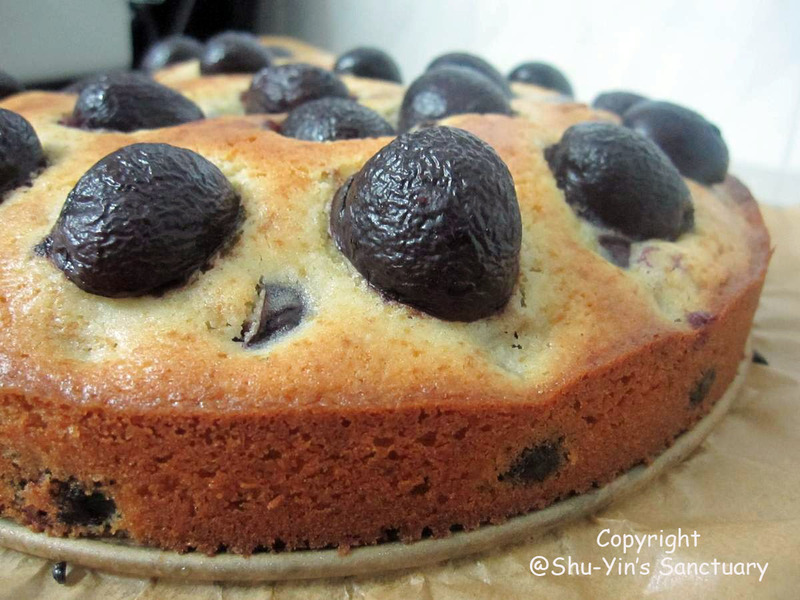 Those wrinkled cherries looks so fat and juicy even after being baked. 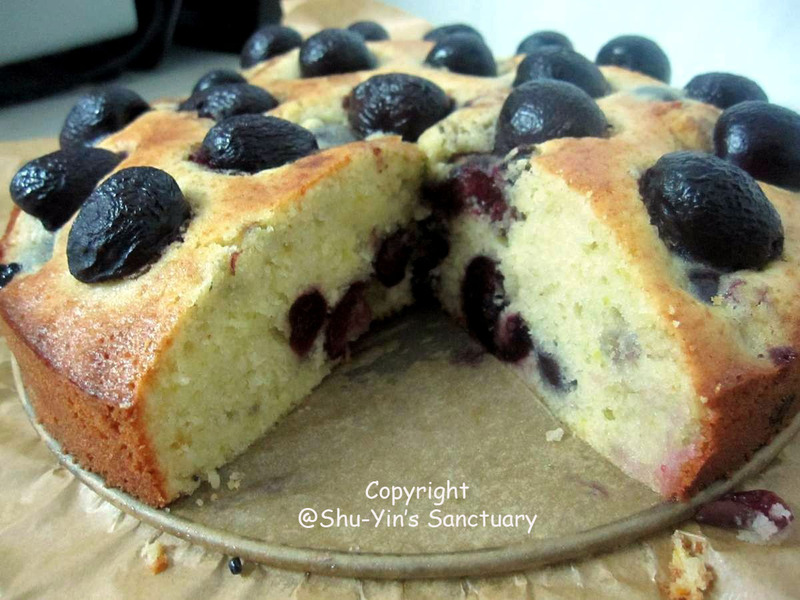 And since this was a midnight bake, there was no natural lighting to show off the beauty of the cake. But it was delicious. Inside was all fluffy and moist. The cherries were indeed as juicy as they looked. The next day, I warmed up the cake and served it with ice cream for my family. They said it was good too. Mum asked me to bake more of these. Well, fresh cherries are not cheap, huh? Joy of Baking has never let me down. 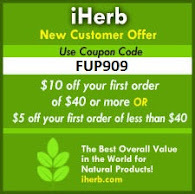 I've tried many recipes from this site and each and every one of the recipes came out good and delicious. I've seen cherries in Tesco going for RM10.89 for 250gm. The cheapest so far and it's sweet. 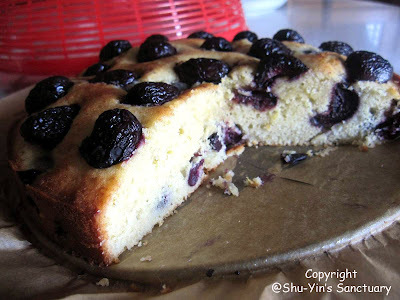 I do not own a cherry pitter too, and I use a chopstick to do the work. 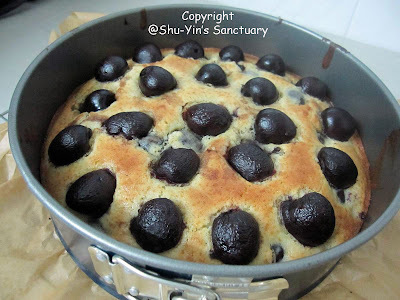 Maybe you can check out my cherry clafoutis post. I did show how I did it with my chopstick. RM10.89 is cheap. I think the cheapest I bought was about RM15. And usually the cherries I bought are cheap, unlike strawberries. I like Korean Strawberries the best. They are really big and sweet. U shd try them. I saw them in Jusco just about a week or so ago for RM14. and i will try the pitting cherries using chopsticks next time! ;) thanks.